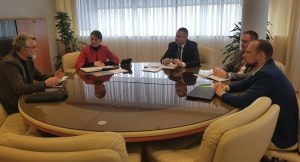 Minister of Economy and Entrepreneurship of Republika Srpska, Mr. Vjekoslav Petricevic held a meeting with Director of Eda, Mr. Miovčić regarding the need and importance of harmonization of SME definition in Republika Srpska with SME definition in the European Union. On this occasion, Minister Petricevic said: “Harmonization of SME definition in Republika Srpska with SME definition in the European Union will be a step towards easier access to EU funds. A better perspective for the private sector is possible through project implementation and more intensive cooperation with Eda. The Ministry will continue to support Eda in the future in preparing new projects crucial for small and medium enterprises”. The meeting was held within the project “European Small Business Act as a framework of SME strategies and policies in BiH – SBA in BiH” which is funded by Sida through the Embassy of Sweden in Bosnia and Herzegovina.